TRACE is UT's institutional open-access repository. It is a publicly accessible archive of research and creative work done by the UT and UTIA research communities. Note: If you would like to add multiple publications, email a list of your publications to trace@utk.edu. Library staff are available to assist UT researchers in adding multiple publications to TRACE. 2. ARTICLE VERSION: What version of the article can you add to TRACE? Most publishers allow you to deposit the post-print of your peer-reviewed article. 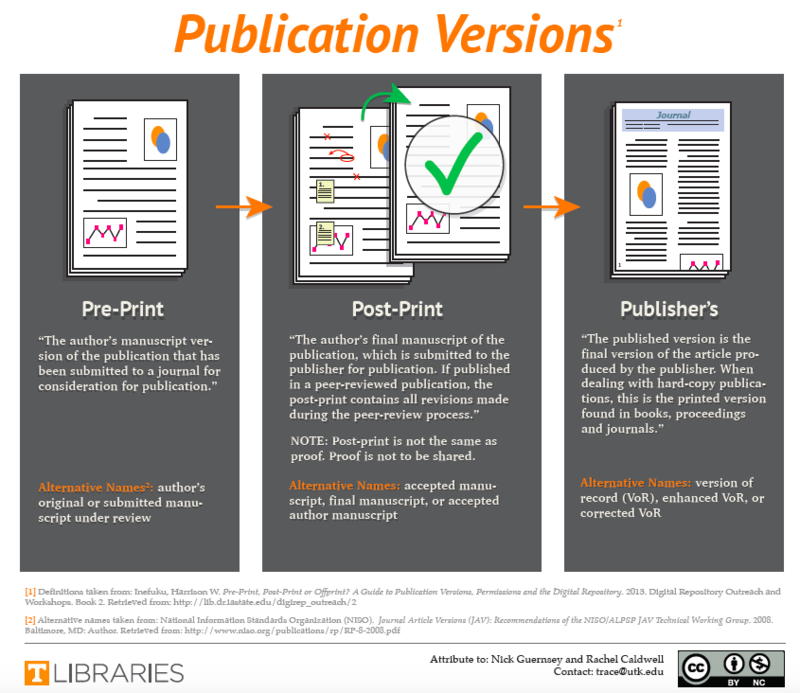 This chart (a PDF, see preview below) lists the differences between the pre-print, post-print, and publisher's version of an article. Look in SHERPA/RoMEO for a green check mark next to "author can archive post-print (ie final draft post-refereeing)." Review the items in the bulleted list under "General Conditions" to find out if there are any specific publisher requirements to follow, such as placing the work under an embargo. TRACE allows you to an an item now, place an embargo, and specify the date at which the embargo should be lifted. Explains preprint, postprint, and publisher's versions of an article. Useful for submitting work to TRACE and other open repositories. full citation to the publisher's version in "Recommended Citation," along with an active link to the publisher's version. 4. IF YOU NEED AN EMBARGO: Add an embargo if needed. Many journals have a maximum embargo of 12 months. After the embargo period ends, the publication will be available to the public. SHERPA/RoMEO will identify the default embargo period. (If the journal in which you were published is published by Elsevier, you will need to check this list for specific embargo periods.) TRACE will automatically lift the embargo on the date you specify -- you do not need to login to release it. 5. AVAILABILITY: Works submitted to TRACE will be reviewed and posted within 7-10 business days, and often sooner. If an embargo is in place, the record will be visible but your file will not be available until the end of the embargo period. "I hold the copyright to this document, or have been authorized by the copyright holder(s) to upload it for distribution, and agree to permit this document to be posted in Trace, and made available to the public in any format in perpetuity. "To the best of my knowledge, I warrant that the posting of the work does not infringe any copyright, nor violate any proprietary rights, nor contains any libelous matter, nor invade the privacy of any person or third party, nor otherwise violate Trace policies."